I am very keen to understand where is SmO2 /tHb testing moving and if it is moving at all. Let me explain the topic: I consider myself as an early adopter of all the endurance sports related gadgets (HRMs, PMs, MOXY, BSX, Smart trainer, etc.) and solutions (1x11, Oval, Rigid, etc.) I was first or at least one of the first to acquire or try all these and many more in my country. In addition I was involved racing MTB/Road for the past 15 years and have some results so it is not only about theory. Every new solution is going through phases (development, early adopters, fans, mass production, death, etc. ), but the most important step here is if the idea is going to be brought from early adopters/fans to mass. Since acquiring MOXY I did almost 200 assessments, checked multiple hypotheses, accumulated tons of valuable data for future analysis and so on. Unfortunately I have quite a sad feeling about MOXY. Once acquired (early 2016) it took some time to read all the available material, acknowledge the possibilities and define best suitable protocols for my testings and hypotheses. In that time there were some webinars, communication and new information posted. However for the last 12-18 months it feels like the sad sunset of the very great gadget: there is no active community, there is no webinars, there is no new information/blog entries published, email communication is mostly one way, etc. My only positive guess about the situation would be that the device is great that it found it way to academic researches, however as I know from the local situation - there are multiple MOXies bought, but they are not used as there is no support and they invite me to share the data collected and to provide insights on how to use MOXY/Peripedal. Also all know, that the team is working on M&A project and hopefully it will give a fresh restart. So is it only me missing meetings and discussions while all others feels very comfortable? I understand your feelings but perhaps the technology came before an acknowledged accepted use. The initial claims (and still perpetuated by Humon) have not been conclusively proven despite many years of experience. But one of the reasons I started my blog on sensor usage was not only to debunk misleading information but maybe find a valuable use case scenario. While I think that the main possibility is in everyday activities (as noted above) and less in testing, I would agree that as a "testing" device to be used in specific test procedures I haven't found that much use for SmO2. Interpreting 5:1:5 isn't that simple and the conclusion often leaves me wondering what limiter was identified - if a test (or a sequence of tests) identified specific limiters (and potential for improvement) for VO2 or for FTP etc I would likely find it more useful. Would somewhat disagree that mass adoption is important for all solutions - solutions should solve a meaningful issue at an affordable-enough price point. Some solutions will always find more - or less - adoption than others. As a device, I would love to see a future SmO2 sensor integrated with acceleration/pose and EMG measurement as it is often not clear whether changes in SmO2 came from a change in load or motion or pose when used outside of a test protocol. Integrated HR/HRV (and maybe also SpO2) measurement would also be nice to simply reduce the number of sensors to charge and connect. That said ... would love to hear other opinions. 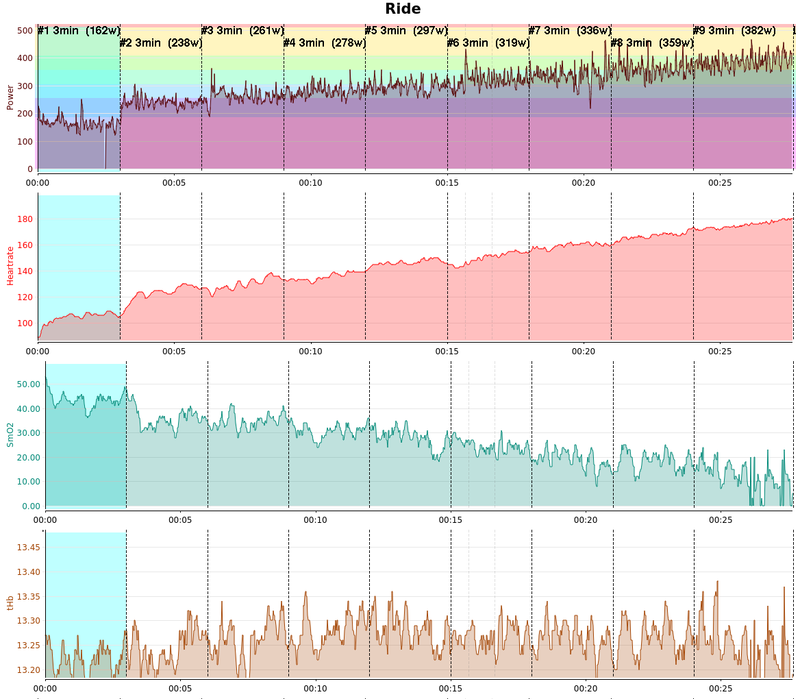 I would really love to see a formalized way to identify the limiters, or define training zones. With 5:1:5 or ramp-test. Something which BSX use to deliver. As an idea, if it's fuzzy do define, may be a way is to build an ML model on the validated test results? Unfortunately outside of controlled [light] environment the reliability of reading often not that great to make any use on the go. May be the only future is for researches in the lab? Yes I read the manual. Thank you for updating it! The thing is, if you want to make the product successful it require to pick up a critical momentum. For example the FTP test concept is easy for an average athlete, pedal hard, take average, multiply by something repeatable to track your progress. And BSX use to provide just that. Simplicity. Just an eye-balling results of a ramp test often impossible clearly define zones as by manual. (Please see my example below. 3min by BSX protocol with Moxy on VL) And just to get the visualization and processing right for analysis does require quite some skills! Until it that complicated, and the courses are fenced. The wide-spread adoption in real life training seems very unlikey. (A cool thing of having a good model, you may not even need to do test, as it could pick up the signals from a ride/workout to validate or update the current zoning). @Oleksiy Yes outside use can be a problem during the daytime. I find that the light shield is too heavy for the runners I coach and it slips down the leg pulling the tape off as well. So after attaching the moxy I put an extra layer over the top of another type of tape, say strapping tape, to block the light. One of the reasons the zones are not as apparent seems to me to be because in the higher loads the load was not consistent during the interval but actually increased during the interval. Also longer than 3 minutes is recommended per workload. There should be 3 main zones, one where SmO2 increases during the workload (usually requires more than 3 minutes), one where SmO2 is stable and one where SmO2 declines. I would say from your graph that you started at too high a load to show Zone 1. Your 1st, 2nd, 3rd and 4th workloads seem to be stable, ie Zone 2. The remaining workloads seem to show SmO2 declining, ie Zone 3. However, the workload gradually increases in most of the later periods so it is unclear whether SmO2 is really stable or declining. I need to be careful how I time my attacks today, sometimes is just sheltering in the pack. I can go harder and longer and don’t need to worry about my recovery that much because I have super good day. My battle is always between not recovered cardiac, and bad respiratory day (I did not win lungs on the lottery for sure) Moxy allows me to really very precisely balance recovery days and easy rides. There is no golden bullet to training, it is balance between anaerobic and aerobic work, nutrition, recovery and developing proper energy system for the job. Moxy with real time feedback is the best tool on the market allowing to judge what is happening. The only wish I have is battery life, my Moxy dies after 2.5 hours and I would love to see what happens after long efforts, those are just technicalities I guess. I've contemplated buying a Moxy several times. The new version is more interesting to me, but there isn't a lot of guidance in how to use it. I was tested at a facility and found that I had a cardiac limiter, so that also made me hesitate to buy one. I'm a cyclist and use Trainer Road and inquired with them, but it doesn't look like they want to bring on something like this. The forum with limited activity says to me that a lot of folks aren't using the product.